Two Voices in Fiber - Go Foxburg! Spring is in full swing in Foxburg and adding to things to do while in town, the Red Brick Gallery and Shop the artist cooperative sponsored by Allegheny RiverStone Center for the Arts (ARCA) is please to announce its second guest art exhibition of the season “Two Voices in Fiber” in the Upstairs Gallery. 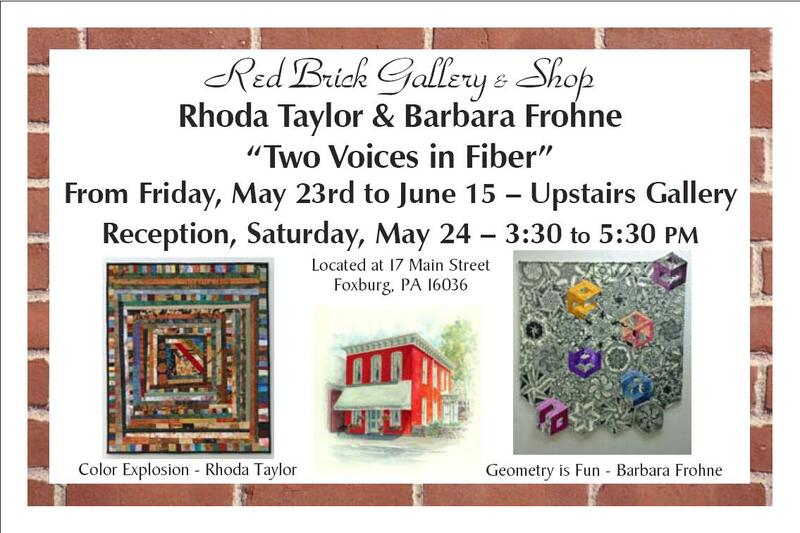 “Two Voices in Fiber” will feature the colorful and exquisitely intricate works of Rhoda Taylor and Barbara Frohne beginning Friday May 23rd with an Opening Reception Saturday May 24th from 3:30 PM to 5:30 PM. Ms. Taylor and Ms. Frohne are dear friends. Both are Western Pennsylvania artists, both retired educators, both now reside in Slippery Rock, PA and are bonded by art of the hand and eye, Barbara the quilter and Rhoda the fiber artist. 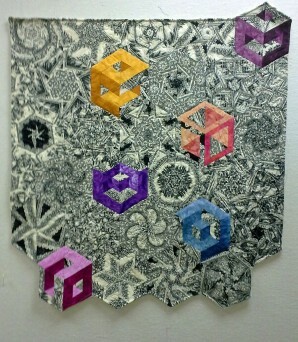 Rhoda Taylor is a Red Brick artist member who works mainly with fabrics. She has drawn, painted, sewed fabric, knitted, crocheted, embroidered, and done some form of art as long as she can remember. Following retirement as a university professor of biology she took quilting classes, fell in love with commercially available fabrics, and felt compelled to make fabric wall hangings. 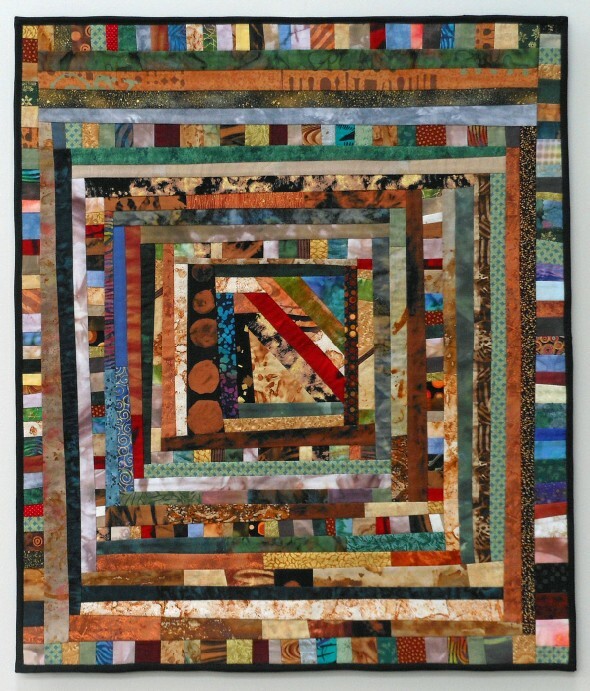 She joined the Fiber Arts Guild of Pittsburgh and began taking a number of workshops from nationally known artists through the Guild, and other sources in which she learned a variety of techniques. As a biologist, she is fascinated by the patterns and colors which occur in nature and produces patterns on fabric by hand dying, bleach discharging, and rust-printing. It is exciting to her to iron the damp dyed, discharged or rust-printed fabrics and see wonderful marks and patterns develop almost serendipitously! She then “paints” with these patterned fabrics, assembling and stitching them with commercial fabrics, including coffee filters, into works of art. Rhoda’s work has been juried into more than 35 art exhibitions. She has solo exhibits in Maryland, including one later this year. She shows and sells her work at the Pittsburgh Center for the Arts, as well as the Red Brick and two galleries in North Carolina. She belongs to the Fiberarts Guild of Pittsburgh, Associated Artists of Pittsburgh, the Pittsburgh Society of Artists, and the Studio Art Quilt Associates, Inc. (SAQA). Barbara while teaching at high schools in Venango County became interested in quilting which continued as her life long pursuit and now her passion since retirement. 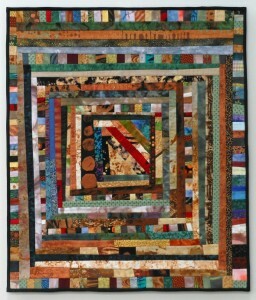 Her beautiful and colorful patterns accent both the traditional quilt and what are now termed “Wall Hanging Art Quilts”. She enthusiastically shares her skill and the Art of Quilting through teaching at Institute for Learning in Retirement (ILR) which holds classes at Slippery Rock University. This is her first major show with Rhoda Taylor and she is enthused to be sharing the space with a fellow fiber artist who also a friend. Have the opportunity to meet both artists at the opening reception on Saturday afternoon May 24th. The Red Brick is located at 17 Main Street in “downtown” Foxburg and is open on weekends. The artist cooperative is composed of local and regional artists who include painters, weavers, photographers, and potters. The members in turn all share shifts of gallery time to enable the Red Brick to be open. To know more about ARCA and its mission, as well as the Red Brick Gallery and Shop visit www.alleghenyriverstone.org. The current Upstairs show is Fritz Keck’s “Oil Portraits of Historic Pittsburgh” now through May 18th; which is a nostalgic moment down memory lane of Pittsburgh neighborhoods. Viewers often invoke, “I remember that place” and then launch into a story. The Gallery phone number is 724-659-0003, and during open hours will be answered by the current artist at the Red Brick. Callers during non open hours can leave a message for a call back at a later time. The new extended Gallery hours are Friday Noon to 8 PM, Saturday 11 AM to 8 PM and Sunday 11 AM to 4 PM.